Communicate With Your Galactic Family! All of humanity has ancestral connections to the stars. Those humans who are destined to remember this are what we call Starseeds. Learn more about Starseeds here. Do You Feel Like You Have Galactic Beings Among Your Team of Guides & Angels? 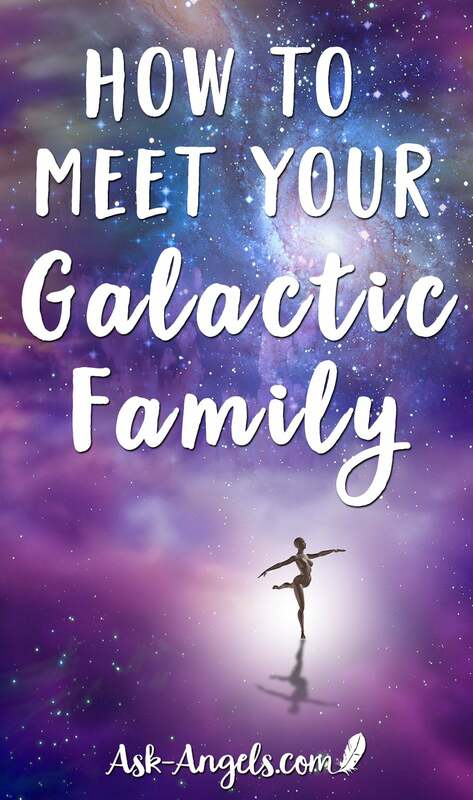 If you feel that you have Galactics, Arcturians, Sirians, or Pleiadians on your team, this is exactly what I’m talking about when I say Star Family. You don’t necessarily have to recall exactly where your Galactic origins are, or where your galactic guides might come from. You might have a deep inner feeling that your roots, your true place of origin, is in the stars. As Starseeds, or ascending humans, there is benefit in connecting with our Galactic families who are of Christ light and of the crystalline Christ consciousness. As you walk the ascension path, connecting with your star brothers and sisters who have already ascended into the 5th, 7th, 9th, 11th dimensional planes of existence becomes more and more important. These beings are ready and willing to serve you in ascending and elevating your vibration. Although our star families are often more highly evolved, this does not mean we are inferior. In fact, the reason why there’s so much attention and energy on planet earth at this time is because humanity has an unprecedented opportunity in this physical lifetime to fully embody 100% source God consciousness. To learn more about what it means to be a divine human click here. The opportunity you have is to become divine humans in the physical world. Not only in the higher dimensions, but actually bring the higher light onto the new awakened earth. This is the golden age. This is the new paradigm. This is what we are moving into and it’s an opportunity for humans alone. You can, in this lifetime, reach a higher vibration within a physical body than any other being. Being human is a beautiful opportunity and yet, there is immense help, guidance, and love from the stars. How Do You Connect with Your Star Family? Interestingly, connecting with your Galactic Family starts off in the exact same way as connecting with Angels, Ascended Masters, or your higher self. It’s made possible by opening your heart, entering inward, raising your vibration, and expanding your consciousness to become a vibrational match with the higher dimensional star beings. Once you elevate to this state, there’s a few ways in which your team can connect. Dreams are a common way to connect. Telepathically is another common way. There is the light ship connection – where your team actually materializes as a light ship in order to link with you. Lower levels of emotion, doubt, insecurity will block your ability to connect. Your star family often looks much different. If they are of the light, if they are of Christ consciousness, they honor your free will. Like Angels, you have to call them in and ask for them to make the connection. It’s essential to let go of fear. They don’t want to scare you. If they reach out to make the connection and you respond with terror and fear, they’re going to back off and not reach out because that fear energy limits your growth and limits your potential. Your star family wants to help you ascend and triggering fear to make the connection has an adverse effect on that process. Eliminate fear, cleanse your energy, and clear out lower vibrational energies and past life experiences. Do a full emotional cleansing. When you cleanse out and release the lower levels, you empower yourself to tune in at a higher level. This includes tuning into Angels and your star family. Before connecting with any light being, ask, “Are you of the light? Are you in alignment with Christ consciousness?” If they are, they will say yes. Congratulations! You have met a guide who can serve and support you. All beings have to answer this question authentically and truthfully. They cannot lie and say they are of Christ consciousness if they are not. If they’re not, they may shrug their shoulders and walk away or they may say, “Oh no, you got me.” That’s when you release them and call in your star family, who are of Christ consciousness, because that’s who can help you ascend and who are worthwhile to connect with. There are thousands of different Galactics in all kinds of different shapes, sizes, colors, and dimensions. Open your heart and ask them to make the connection. This is a powerful invocation before meditation or when you are outside at night, looking up at the stars. Sirians are incredible alchemists and can help you in transmuting your physical body into the golden divine enlightened human being you authentically are. There are the Arcturians, who are an incredible collective with immense healing and clearing capabilities. Of the thousands of different Galactic beings, there are so many who have fully ascended, who are fully embodying Christ consciousness, and who can serve and guide you in your ascension. If the idea of connecting with your star family lights you up, invite them in. This is not required. You can work with Ascended Masters who have ascended on earth. However, if it resonates with you, you do have the option as a Starseed to work with the Galactics. It can be a fun, empowering, and exciting thing to do. If it speaks to your heart, call in your Galactic family and let them then guide you as to what is possible. There is much more in store for us when we work together in these powerful ascension times. ← Receive A Divine Attunement for Chakras & Open Pathways to Inter-dimensional Experience!